Being a native of a tribal village in Jharkhand, my life was full of difficulty, added to that my husband was an extreme alcoholic and he used to be very violent with me when he was drunk. Our only small farm land was mortgaged to build a well for irrigation and I found it extremely difficult to pay back the money. On most days we went to bed hungry. In 1999, a Pradan bhaiya (Pradan professional), came to our village. Gradually he got a few women talking amongst ourselves and the idea of a Self Help Group (SHG) was floated. We started saving Rs. 2/- a week in the group and that was the first time I had money in my name! Alongside – I also started working as the accountant of the group as I had studied till class 9, while other members did not have the fortune to go to school. I travelled 18 kilometres to attend book keeping trainings and in those days owning a bicycle was a distant dream. My association with the SHG helped me learn different livelihoods, especially agriculture and livestock rearing — all these made me financially more resilient and socially established. 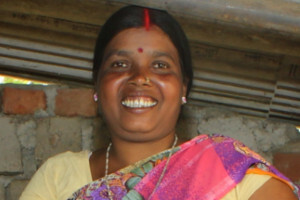 Till date I have repaid more than 20 loans that I had taken from my SHG. Out of these, the most remarkable was a loan of Rs. 80,000/- which I took for my son’s medical treatment.